Treasures of South Florida Libraries. Florida State University. Florida State University. Special Collections, Robert Manning Strozier Library. Tallahassee, Florida. Florida State University is one of the largest and oldest of the nine institutions of the University System of Florida. The school had its beginnings as early as 1823 when the Territorial Legislature began to plan a higher education system. In 1851 the Florida Legislature planned two seminaries, one to be east of the Suwannee River, the other west. By 1854 the city of Tallahassee established a school for boys which the State took over in 1855. In 1857 it became the "west" Seminary. During the Civil War, this school became the Florida Military and Collegiate Institute. The first B.A. was awarded in 1891. In 1901 the school was named Florida State College and in 1905 the school became Florida Female College, later Florida State College for Women. The school became coeducational again in 1947 and was renamed Florida State University. In 1903 the first library was begun and during the 1950s the Robert Manning Strozier Library was built. The Library has over 1,600,000 books and periodicals. Special Collections, in addition to rare books and manuscripts, includes The Florida Collection, the Shaw Collection of "Childhood in Poetry," the University Archives, The Research Collection on Napoleon and the French Revolution, the Carothers Memorial Collection of Bibles and Rare Books, the McGregor Collection of early Americana, the Lois Lenski Collection, the Scottish Collection and the Kelmscott Press Collection. Lois Lenski Collection. The Florida State University Library has a very fine Lois Lenski Collection which was started in September, 1958, when this well-known author and illustrator presented a collection of her books, original drawings, articles by and about her, and miscellaneous items to the library. The collection continued to grow through further gifts from Miss Lenski and purchases. Several of her books have been translated and published in foreign languages, and some of these are in the collection as well. Many original illustrations for her books, lithographs, linoleum, and wood block prints add to the interest and value of the collection. For many, especially baby boomers, Lois Lenski was one of their most beloved childhood authors and illustrators. Her work ranged from picture books to children's novels, all self-illustrated. Lois Lenski was born in 1893 in Ohio. She trained as a teacher but her interest in art led her to New York City where she attended the Art Students League where she put herself through school by doing book illustrations. In 1927 she wrote her first book Skipping Village. Lenski quickly became popular and produced at least one book a year for the next forty years. In the 1940s ill health and an aversion to cold weather forced her and her family to winter in the South. In the winter of 1942-43 she visited Florida and was inspired to write Strawberry Girl. The story is based on the sight of families with children working in the strawberry fields outside Plant City and Lakeland, Florida, and the Cracker life they led. The book won the American Library Association's Newbery Medal in 1946 for "the most distinguished contribution to American literature for children." In 1951 Lois Lenski built a house in Florida and made it her permanent home in 1964. She died in Florida in 1974. Spring is Here. One drawing. In pen and ink. 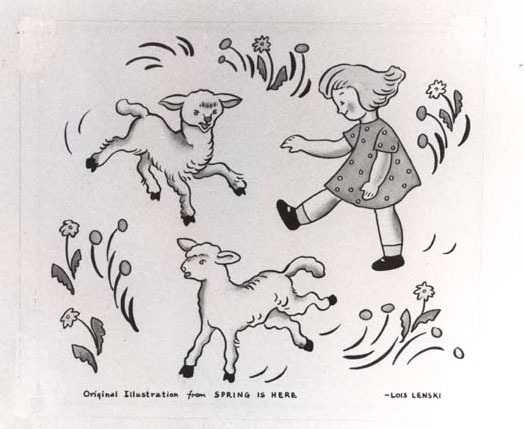 Manuscript note by Lois Lenski: Original Illustration from Spring is Here. Signed by Lois Lenski. Published by Oxford University Press in 1945. 1. "The Bird with the Silver Wings." In pen and ink. Manuscript note by Lois Lenski: Original Illustration for SONGS OF MR SMALL. 2. Untitled landscape in pen and ink. Signed by Lois Lenski. Published by Oxford University Press in 1954. Florida State University Lois Lenski Collection. Bookplate. Designed by Lois Lenski with an illustration of Birdie Boyer, heroine of Strawberry Girl. [Herbarius.] Incipit Tractatus de Virtutibus Herbarum. [Venetiis: Impressum per Joannem Rubeum & Bernardinum fratres Vercellenses, 1509]. Spine title reads: Villanova. Among Florida State University's other holdings in Special Collections is a herbal from the early sixteenth century printed in Venice. Early printed herbals were highly stylized, unlike their late medieval manuscript counterparts. One series of woodcut illustrated editions begun in 1480, known as the Latin Herbarius, was very popular and was printed in a number of editions. The book is divided into two parts, the first consisting of descriptions and illustrations of one hundred and fifty plants from Germany. Many of these editions were erroneously attributed to Arnaldus de Villa Nova.